From warehouse to media center in less than a week. 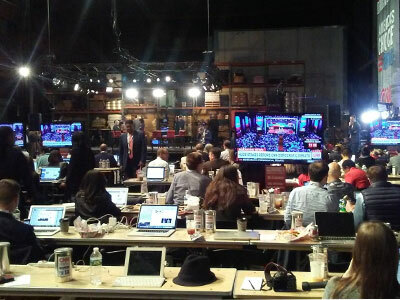 With almost 700 journalists requesting media credentials for last night’s Democratic debate in Brooklyn, CNN found itself in the market for a large space to host the reporters, photographers and TV crews who were going to spend their Thursday working out of the press file center. When the Brooklyn Navy Yard’s Duggal Greenhouse was chosen as the debate site, CNN went to work figuring out where it was going to house the journos. With the help of the Navy Yard and an eager building owner, it settled on building number 269. Building 269 is a long, cavernous space. Like the debate hall, the site was used for building ships during World War II. While it is an enclosed space, the impossibly high 60-foot ceilings, exposed beams and cross beams, and rows of windows that line the walls from end to end give it an open air feel. Save for the coffee bags and beer barrels that reside there as part of the building’s current incarnation as a warehouse (when it isn’t being used for TV and music video shoots), the space was empty when CNN and production partner Harbinger Outreach scoped it out Wednesday of the previous week. It was devoid of the barest necessities, let alone those that make contemporary journalism possible. There was no heat, no lights, no phones, no Internet, no restrooms. The work began Sunday, when outside vendors were called to install phone lines, cable and wires. Internet arrived from across the river, pulled in through a microwave receiver installed on site. On Monday, generators were brought in to provide power. It would take two days just to get the building heated. The crew, meanwhile, worked in their coats. On Tuesday, the tables, chairs and lighting were put in place, and Wednesday was devoted to details. Row upon row of the thin foldable tables filled the space, a tall canister and a 28 gram bar of Mast brothers chocolate in front of every seat. Throughout the day Thursday we would occasionally hear a maraca-like rattle, the sound of somebody shaking the tin and opening it to discover it held coffee beans. The beans came care of the Brooklyn Roasting Company, the same roasters who maintained two kiosks in the back of the building, doing their part to maintain a collective caffeine buzz by handing out free hot and iced coffee morning to night. Lunch was available for purchase in the back, a choice of offerings among four food trucks parked in a small outdoor space fitted with green picnic tables. Like the debate space, these atmospheric elements–the roasters, food trucks, exposed space–were all part of an effort to provide a work space comfortable enough to spend a day in that simultaneously maintained its sense of identity. And if you needed that spelled out for you, it was, right there on those tins of coffee beans, roasted in Brooklyn.